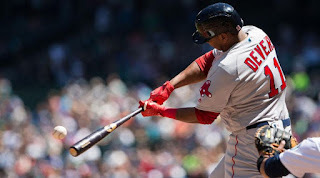 The Pesky Pole : 2019: The Year of Rafael Devers? I've long boosted Devers as a prospect, ranking him in my top 10 prospects in all of baseball multiple times, even arguing that the Red Sox were right to keep him and trade Yoan Moncada in the Chris Sale deal. Devers has enormous raw power and has always had a solid idea of the strike zone, posting high contact rates throughout the minors even though he was always young for where he played, and has shown adequate walk rates so far in the majors, although I think there's a lot more patience to come there. He also had a flukishly low .281 BABIP given how much hard contact he made last year; his Barrel rates -- a Statcast-derived stat based on a batted ball's exit velocity and launch angle --- were right there with those of Gleyber Torres and George Springer, who both hit over .300 on balls in play. Devers will play this entire season at 22, so he's already got a year-plus of major league experience at an age when college draft picks are just entering their first full year of pro ball. I might be a year early on this one -- I've had that happen a lot before -- but I believe in Devers' swing and approach enough to lead with him this year.